After watching the episode of Caroline Pointers "What's Up Genealogy? Show" with Denise Levenick, the Family Curator I took a look on some of our family heirlooms. From my mothers side - she was adopted at the age of 4 - I have quite a precious and old heirloom from her adopted family. During the period 1768-1771 the woman in each parish who spun the finest linen yarn, suitable for premium fabric was awarded a silver spoon. 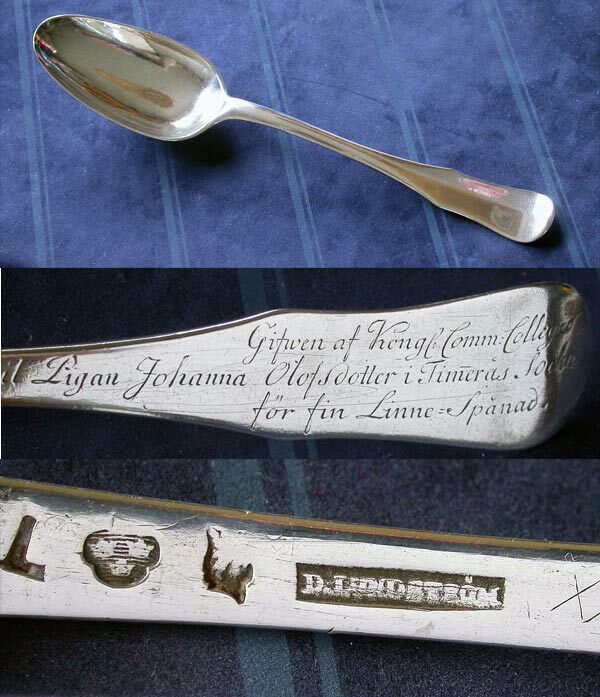 Besides this inscription all swedish silverware have stamps. On the photo above the L would suggest production year 1769. The three crowns that it's made in Sweden. The next could be the sign for Stockholm, the place where the silversmith Daniel Lundström was active between 1751-1788. I have tried to establish a family connection between my adopted grandparents and this Johanna, but so far no luck. 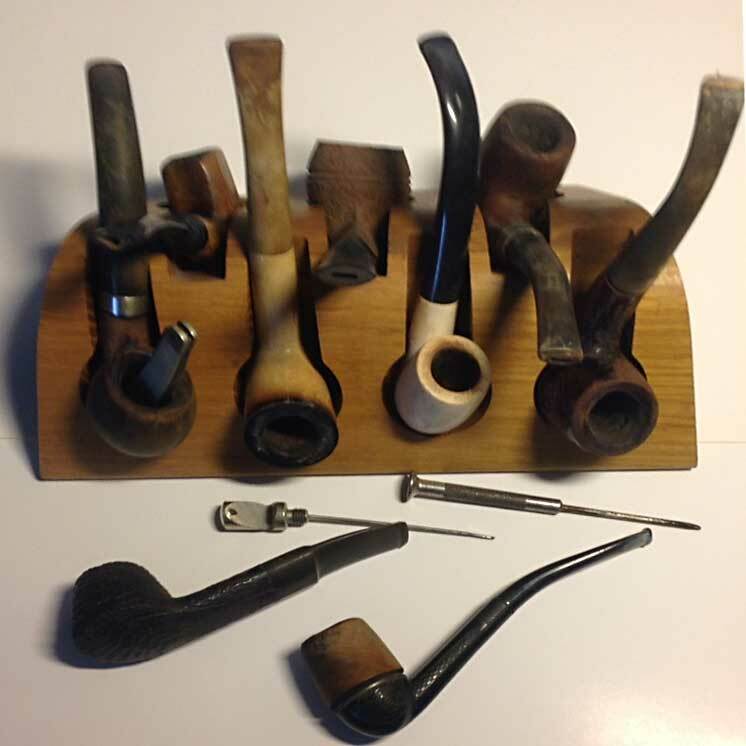 His entire collection of well smoked-in pipes are kept as a memory - not just in a positive way but also as a reminder of his last years suffering from COPD (Chronic obstructive pulmonary disease). Are you sure the spoon is from the adopted family's side? Maybe it's from the birthparents side, just a thought. It has a lovely story that goes with it. Perhaps putting it in a display box with the story printed next to it would be in order to be sure the next generation doesn't forget the story connected with the heirloom spoon. 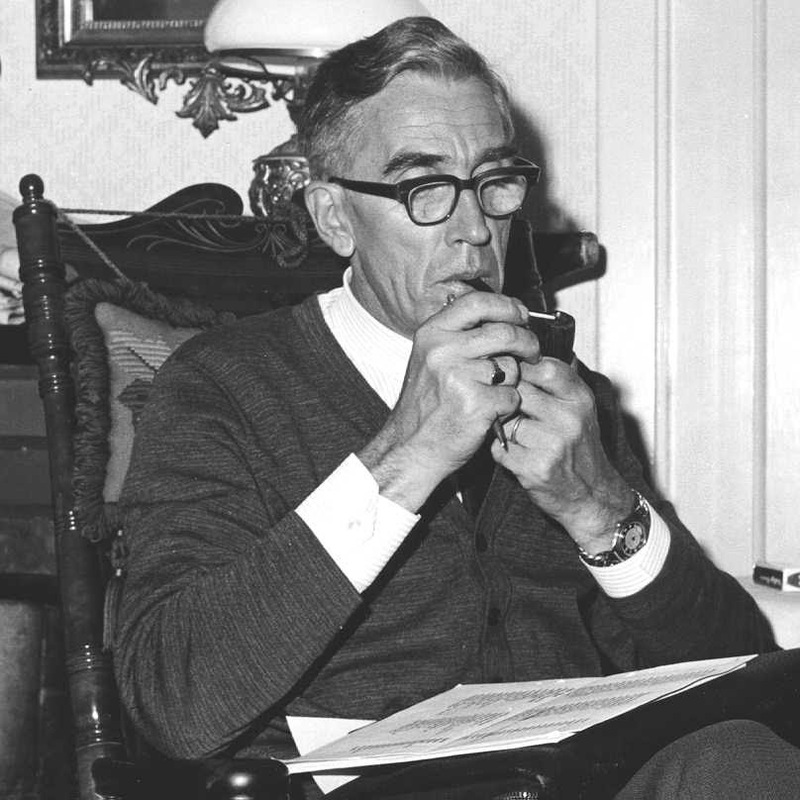 Your pipe display reminds me of my grandfather, who gave up smoking cigars to instead smoke pipes. I always remembered the lovely smell of some of his flavored tobacco, before it was smoked. Why it didn't smell the same after being smoked was always a disappointment to me. We have the end table grandfather kept his smoking supplies in and even today, thirty years after he died, you open the drawer and it still smells of his tobacco. It's like a little piece of grandfather comes wafting out of the drawer then.